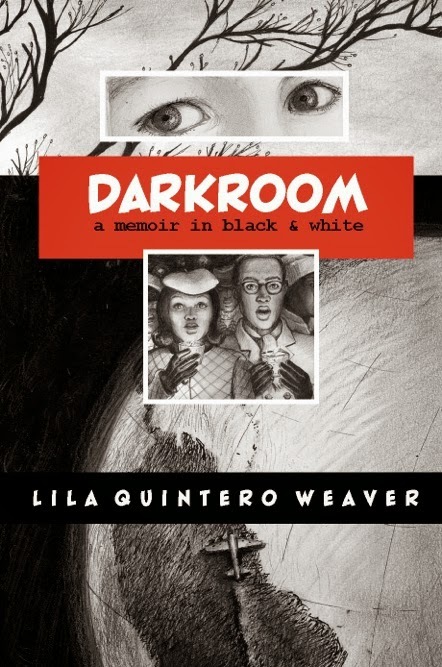 Darkroom: A Memoir in Black & White (The University of Alabama Press, 2012) by Lila Quintero Weaver is one of the most moving and visually stunning graphic texts I’ve seen, on par with American Born Chinese by Gene Luen Yang. In this memoir, Lila tells the story of her family’s immigration from Argentina to the tense, roiling South of the 1960’s. She traces her experience, beginning in girlhood, as a non-white, non-black witness of some of the painful battles of the Civil Rights movement; as a new American struggling with questions of American identity and belonging; and as a young woman perceiving deep racism for the first time. This is an ambitious work, and it delivers on its potential. I was moved to tears multiple times as I read. Through Lila’s pencil drawings, I connected with the history of the United States and the struggle for racial equality in a new and visceral way. Undergirding the drama of the setting and period were the interweaving and conflicting mores of Argentinian and American cultural life. This memoir gave me the gift of “seeing” a vital piece of our history through another’s eyes, and I can’t recommend it highly enough. 1. 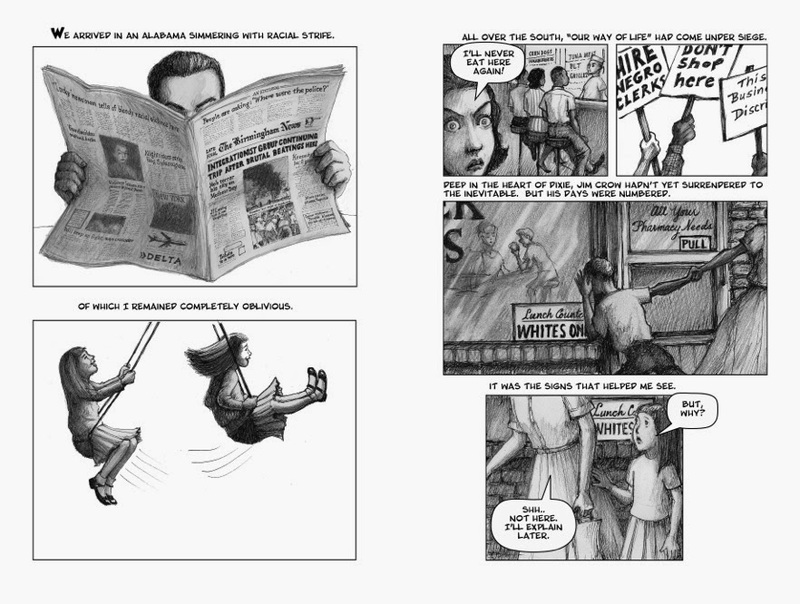 Can you tell us about the different kinds of work art and text do to tell a story in a graphic novel and your process in developing their interplay? I'm not the first to say it: The graphic-novel format is akin to cinema, with graphic memoir and other nonfictional treatments functioning somewhat like documentary film, wherein you get the benefit of voice-over, dialogue and visuals. Sometimes a silent scene can be quite powerful. It takes discipline to leave it untouched by words. But sometimes you need narration to segue from one scene to the next, or to explain a complex situation, enhanced through visuals. I love this interplay. Working with images increases the layers that one can offer, such as making visual puns or enriching a scene's background with details that invite the eye to linger. In Darkroom, my goals were to relate my family's immigration narrative as vividly as possible and along the way, to share some views on ethnic identity and racial conflict. It's such a boost to have illustration at my disposal for these goals. It broadens the palette. I can include a diagram or a visual analogy. I can employ ink renderings of family photos to bring faces and family history to life. 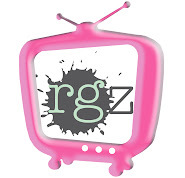 Did you start with text and add art or the reverse? Or did you create both simultaneously? My first draft was text-only. I needed to shake out ideas as quickly as possible and get a sense of what material belonged and didn't belong. The next two drafts included sketches and page layouts. As I got into the final version, new ideas sometimes emerged as visuals and I added whatever text they required. Back and forth like that it went through four years of work and the execution of 500+ illustrations. Whew. 2. Considering the powerful and emotional content in your book, did you experience any particular challenges or doubts during the creative process? Yes! Unless you're a celebrity, you begin by wondering why the heck anyone would want to read your memoir. You're inundated with doubts about finding universal themes in your ordinary life, and once you find those themes, you're anguished about stripping away the veneer of privacy that you've always counted on for self-protection. But a memoir without emotional exposure is cold and uninviting. You have to make peace with that essential nature and do the courageous thing. Otherwise, what a lost opportunity to touch the reader! 3. Your book feels to me like one of those marvelous crossover works that is equally appealing to teens and adults. Do you have an "ideal reader" or even "ideal audience" for your book? Thank you! Crossover is a great word for how the book has been received. During the process I tried not to write for a particular demographic sector. I simply concentrated on telling the story in my voice, including the visual aspects that make up my communication style. After the book came out, I was surprised and thrilled when librarians and high school educators latched on to it as a YA fit. It's also found its way into college classrooms, which is another fantastic outcome I didn't foresee. And some of my readers come from the older generation, I’m delighted to say. Most of them have never picked up a graphic novel, but they're drawn to personal accounts of Jim Crow and desegregation, a historical era they experienced directly or read about as it developed. A few of these older readers have hopped on board with graphic novels and that couldn’t make me happier.